A soldering iron may be needed even if you are building electronic breadboard circuits. Wires may need to be soldered to electronic components such as potentiometers so that they can be connected to the breadboard. LCD displays usually also need a pin header or wires soldered to them for breadboard connection. Soldering irons used in electronics are usually in the 15W to 25W range (15 to 25 Watts). They will come with either a small chisel tip or conical tip. Other shaped tips are usually available separately. The cheapest irons are stand-alone type that do not have a temperature controller. These are fine for starting with. 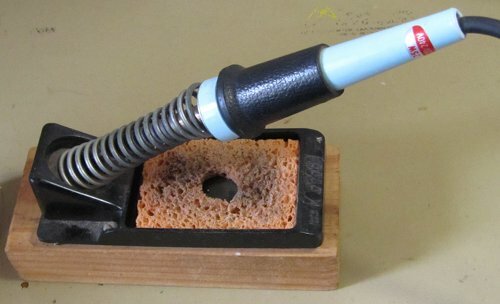 You will also need a soldering iron stand that comes with a sponge. The stand keeps the iron from burning anything on your desk while you are heating it up or using it. The sponge is wet with water and then squeezed out. It is used to clean the soldering iron tip while soldering. 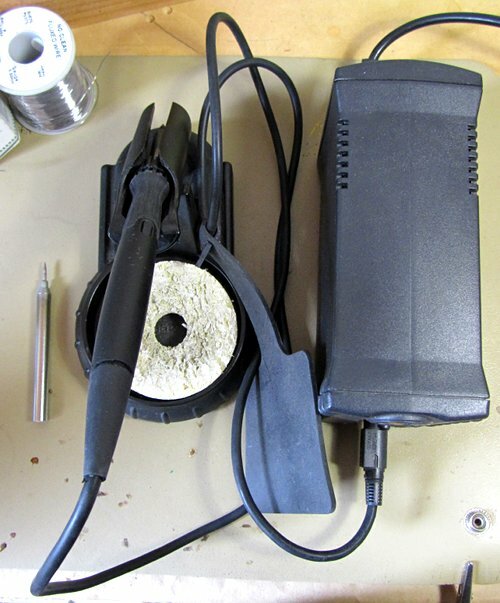 A soldering iron station has a temperature controller and comes with a stand and cleaning sponge. The image below shows a soldering iron station and spare soldering iron tip. The soldering iron shown above has a much shorter tip than the tip used by this soldering iron station. 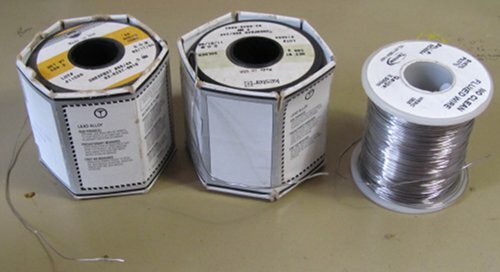 Solder wire is normally sold on rolls. The solder wire contains flux which can be rosin or no-clean flux. I would recommend 0.5mm solder wire with a composition of tin / lead (Sn / Pb) for electronics use. Get either 60/40 or 63/37 solder where these numbers are the ratio of tin to lead (e.g. 63% tin, 37% lead). 0.8mm solder wire can also be used but 0.5mm solder wire is preferred. See the soldering article for information on using a soldering iron.